XRouter Beta is in the final stages of QA and will be released soon. Additionally, we created a Docker plugin for XRouter that is the foundation for Blocknet’s XCloud platform. Containers on docker hub (hub.docker.com), including a large number of Enterprise applications, can be monetized and served through Blocknet’s XRouter interoperability protocol. Developers and Service Node operators will be able to test XCloud docker applications in XRouter Beta. Likewise, any developers that want to leverage your service via XRouter can integrate with it using the XRouter protocol. Blocknet’s XRouter interoperability protocol is the only truly decentralized interoperability protocol. Over the next few months efforts will be made to migrate to a new base blockchain in forking the latest v18 Bitcoin codebase to replace the inherited fragile PIVX/Dash code. The reasons for forking Bitcoin are: (1) Our team is already familiar with the BTC codebase; (2) Easier integration of our existing XBridge and XRouter code; (3) Much easier incorporation of upstream security updates and optimizations (on the current chain we’re unable to efficiently incorporate upstream changes from PIVX/Dash); (4) Security and stability, Bitcoin has a much more resilient and tested codebase; (5) Scalability, we need an overhaul of our RPC and networking code to support mass adoption of XBridge and XRouter; (6) Bitcoin has a strong and active developer network. This change is needed due to currently spending 50% of development time maintaining the current PIVX codebase, which is not a feasible approach when we have the goal for mass adoption of XBridge and XRouter. Additionally we will be implementing: (1) On-chain governance (proposal voting will be recorded directly on-chain); (2) Moving everyone to staking rewards with a single tier block reward. Service Nodes are not going away, but they will be exclusive to powering DX/XBridge and XRouter. Service Nodes will be able to stake, can earn additional fees through XBridge and XRouter, and will not experience anymore long wait periods to activate Service Nodes (looking at 2–3 network confirmations for snode inputs). You will also be able to signal multiple staking inputs to validate your node (no longer need a single 5k input). We plan on building golang and c++ libraries for accessing the XRouter network, so that developers can integrate with XRouter without requiring any Blockchains to be installed. This will allow 3rd parties, companies, and other crypto projects to add support for XRouter in their own chains and applications without installing the Blocknet wallet (such as smart contracts). A new feature article focusing on Block DX and “ultra-trustless trading” was published on Bitcoinist. Check it out here. 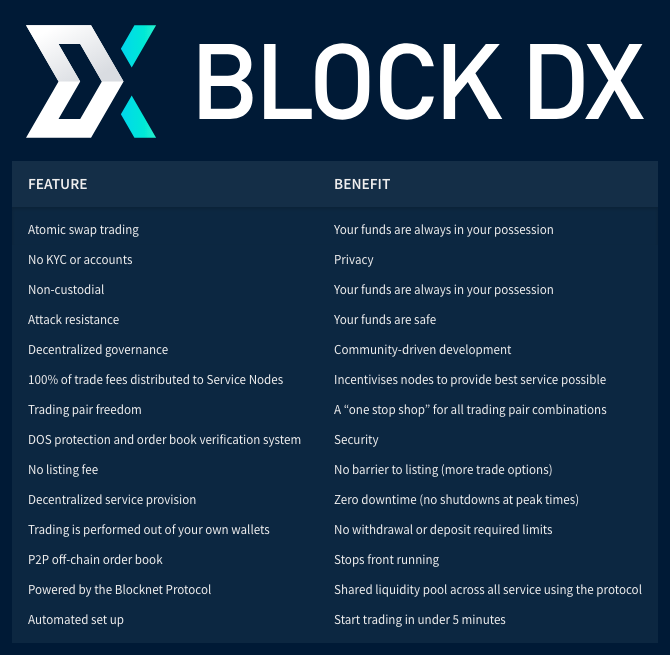 A new article was published on Blocknet’s blogon the topic of how much time, effort, and hassle can be saved by trading on Block DX. Read it here. The latest Coin Recap has been published here. Several articles are in the pipeline at various stages and others require final review. Twice per week, Twitter and Discord polls are now created for the next token to be added to BLOCK DX. These polls are meant to gage interests from these various communities to help prioritize integrations. The proposals for Superblock 864000 can now be viewed here. Voting will close on block 861120, but your node must remain active until block 864000 for your vote to count. Over the past several months we’ve focused on being listed on more prominent exchanges in order to increase our liquidity, volume, access, and exposure. Exchange update: BLOCK is confirmed to be listed on a leading exchange (top 10) in the coming weeks. We also have another confirmed listing on a highly anticipated exchange that is slated for 1–2 months from now. Stay tuned for more information. Coin announcements are continuing. We would like to welcome the Electra, Know Your Developer, MasterNode Pro and DogeCash developers and community to the internet of blockchains. We look forward to seeing ECA, KYD, MNP and DOGEC traded on Block DX. Be sure to check out the most recent additions to Block DX in the latest token recap here. You can view the full list of over 100 tokens on the Blocknet Coin Hub. The Blocknet Protocol currently supports 105 blockchains all of which can be traded on Block DX. A full list of the supported assets can be found on the Blocknet’s Coin Hub. You can also view the current prices, ranking and market cap of of these assets (including BLOCK) on the same page. In addition to this list, there are another 23 blockchains that are unannounced. 143 assets are in progress for error resolution + finalization. If you want to be the first see these updates, you can receive the newsletters directly to your email by subscribing here. Our next update is due on April 15th. Until then we look forward to hearing from you!